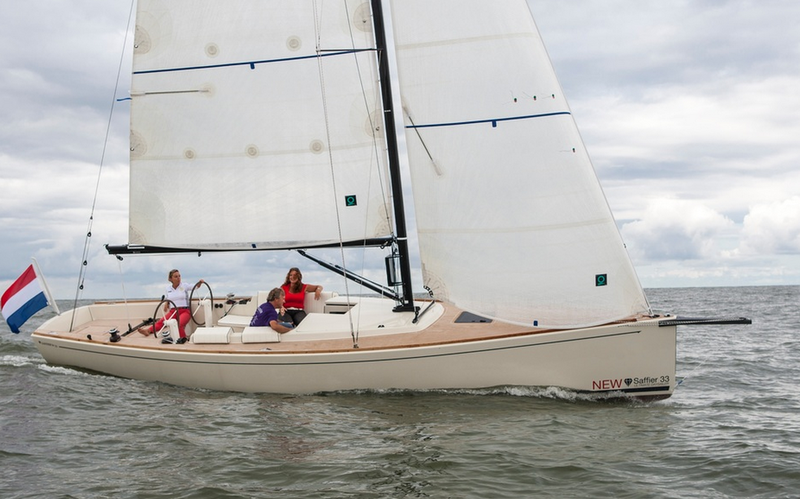 Bavaria’s new Vision 42 offers practically the same comfort as the larger 46, while being shorter, more compact, and easier to handle. The Bavaria Vision 42 is a shorter, stockier version of the Vision 46, but it loses few of the bigger boat's amenities. 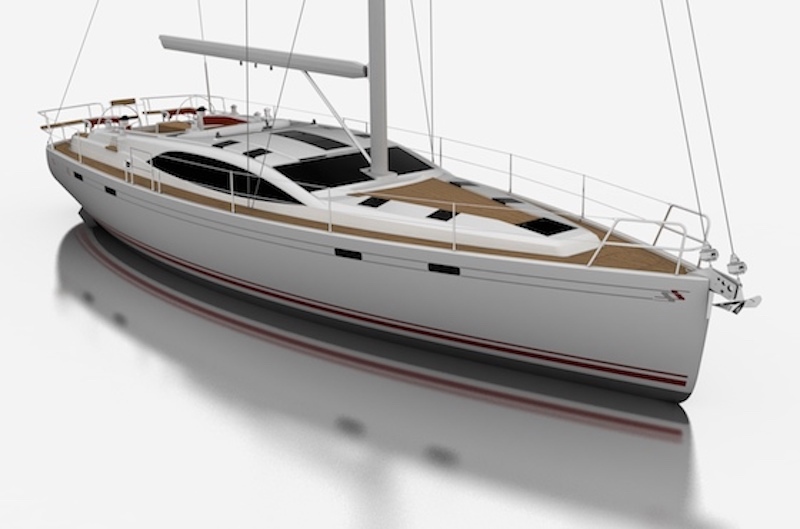 But model updates aren’t quite so simple in yacht construction, especially when going from larger to smaller sizes. Despite apparent uniformity, the devil is in the details. Because humans and their expectations of comfort and convenience don’t shrink as easily, a simple minimizing of size usually doesn’t work. This idea demands adjustments, even though they might not be so obvious at first blush. For the hull of the 42 this means more freeboard and more beam relative to the overall length. The length-to-beam ratio of the new boat is 3.08, compared to 3.26 on the Vision 46, which is 1.2 meters longer, but only 14 centimeters beamier. Hence the smaller Vision 42 appears more solid, at least visually. Yet it remains an elegant boat with consistent lines. Regardless, there’s one detail that stands out: Contrary to the general trend of moving masts farther aft, the Vision’s stick is positioned relatively far forward, because the main bulkhead is farther forward as well. On one hand, Bavaria wants to achieve a spacious saloon; on the other hand, that space should not be marred (visually or functionally) by a mast support in the center. That’s why the J-measurement on the new Visions is relatively modest, which results in less effective sail area for the short, non-overlapping genoa. Wind speeds of 15 knots that gusted to 20 during the test didn’t hurt this boat in the least. The Vision 42 felt stiff upwind and remarkably well balanced. 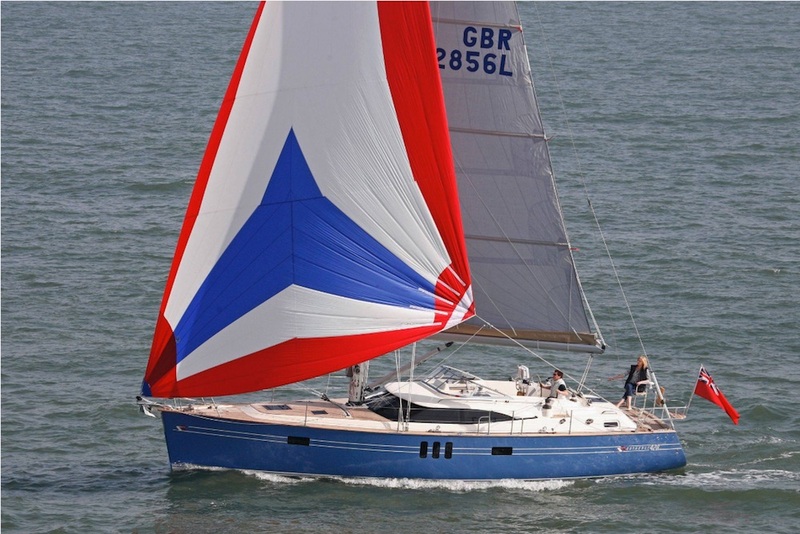 Above 15 knots however, the main needed a reef, which can be done effortlessly by pushing buttons with the optional in-mast roller furling and electric winches. Sailing to weather at approximately 40 degrees true wind angle, the Vision hit 7.2 knots on the GPS, which is above average for a 10-ton cruising boat. However there’s no doubt that the upgraded sail wardrobe on the test boat, with radial-cut laminate cloth and vertical battens in the main, had a positive effect. 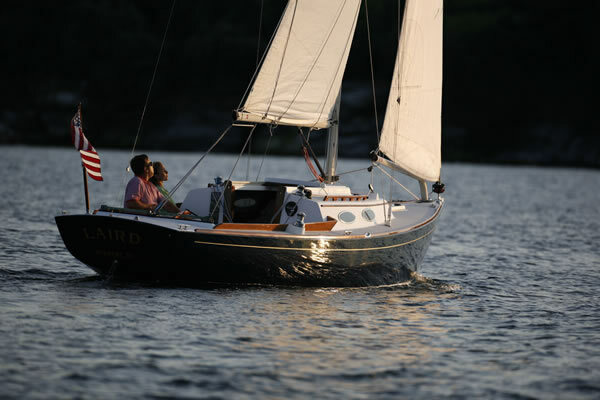 It was gratifying to notice how smoothly this Farr design steered through the short and steep waves despite its voluminous hull. The bow slices through the water cleanly without bashing and hobbyhorsing, and the crew in the cockpit remains dry even without a spray hood -- positive qualities that the Vision 46 also had in her repertoire in a heavy-weather test. The most noticeable and unusual feature on deck is the asymmetrical cockpit arrangement, with an off-center companionway. The advantage over the conventional symmetrical layout is the space for a large L-shaped settee with a fixed table. If desired, that table can be lowered (push-button convenience optional) turning this area into a large sunbathing lounge simply by adding some cushions. The size of the area is identical with that on the Vision 46. 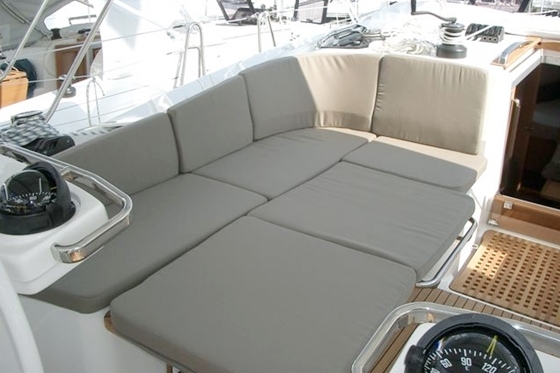 L- or U-shaped settees thus far have been common on larger cruising catamarans or the unconventional Sense models by Beneteau. The Sense 43 therefore is among the direct competitors for the new Vision. The asymmetrical companionway arrangement allows for an innovative L-shaped settee in the cockpit that can be converted into a sunpad. The cockpit layout and the arrangement of the hardware were directly adopted from the 46. Notable is the large, nearly centrally attached winch on the cabintop for the mainsheet and halyard, which could be positioned there because the companionway is not centered. 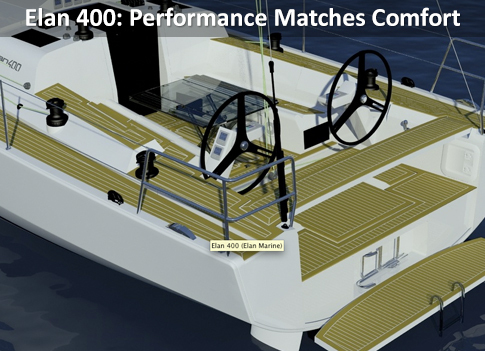 Combined with the properly sized winches on the cockpit coaming (two are standard, two more are optional), the sheeting angles can be adjusted according to personal preferences. The mainsheet could be led through tethered blocks to the central winch if the boat is sailed with crew, or aft to the two winches forward of the steering wheels if it is singlehanded. Switching takes a few seconds, which is why that’s such a cool solution by the designers. For simple and safe maneuvering both under sail and under power, Bavaria offers two new systems: the Dock Control (parking aid with combined bow and stern thruster) and the Trim Control (tacking and gybing per push-button command) for the Vision 42. During the test of the Vision 46, these technically advanced and pricey systems worked flawlessly, even though they are complex to install. Compared to the 46, the area behind both wheels is a bit tighter, yet there’s still enough space to sit comfortably while operating the boat. Because the walkthrough to the swim platform is off center, the backstay is attached on the centerline and out of the way. However, a simple, safe to reach storage area for a life raft is missing from the cockpit. Either the raft has to be stowed away deep in the recesses of the lazarette, where it would be difficult to reach in an emergency, or it has to be lashed on deck somewhere, which nobody would want. Dedicated life raft storage has been a standard feature on boats of this size for a long time. The 42’s interior layout also follows that of the larger model. There are some limitations in the fore cabin, which has significantly less room. A lavatory is available, but not recommendable due to the limited space forward of the main bulkhead. On the 46, a forward head is also an option, but there it can be installed at a decent size and with enough separation from the island berth. But this remains one of the few conceptual distinctions between the two models. Another difference is the huge starboard lazarette aft, which can be turned into a cabin on the 46. On the Vision 42 the restricted space eliminates this option, so a lazarette remains a lazarette with access from the cockpit and the aft head. There are few changes in the port aft cabin, which is fitted with two single berths that can be combined into a king with inserts. Two adults can sleep here with plenty of comfort. Starting at 160,500 euros, Bavaria proves it still offers the lowest price compared to the competition, especially from France. 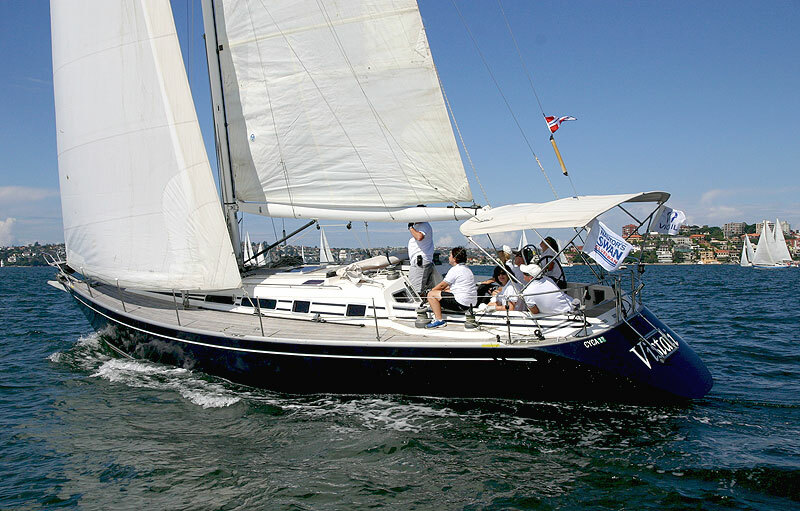 Beneteau’s Sense is listed at close to 220,000 euros while the Sun Odyssey 41 DS by Jeanneau starts at 184,300 euros. 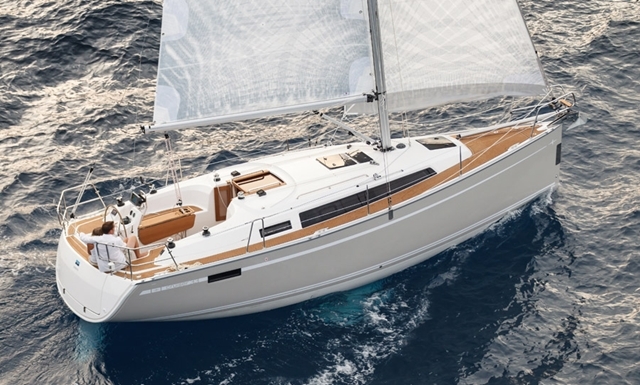 With the exclusive Vision line that is directed at private owners, Bavaria created a thought-out and logical separation from the Cruiser program that also appeals to the charter market. The 42 typifies the concept’s lower end on the size spectrum. It can’t go any smaller, but there are no limits in the other direction. Therefore, the announcement of a new flagship seems inevitable. 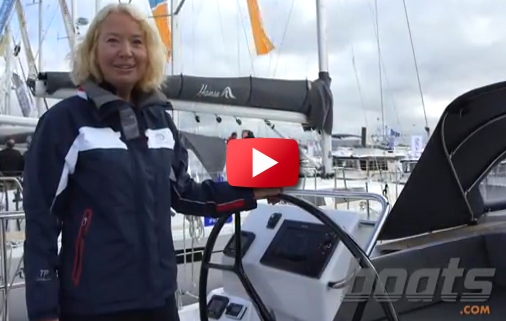 To see the Vision 42 in action, watch the YouTube video below. 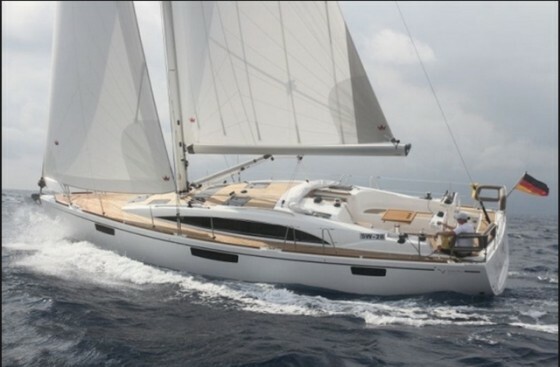 For more information, visit Bavaria Yachts.